Here are some of the cutest farm residents we have ever had at Lakeview Farms. 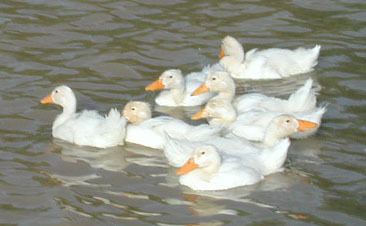 These cute young white ducks were donated by Cindy of St. Peters in the summer of 2005 when they outgrew their home. Since these were domestic animals, we tried to take some precautions to avoid depredation by other critters who roam around the farm by erecting extensive fencing but alas, these ducks had no basic survival skills. During 2005 we lost one duck to turtles, another to mink, and two more to either a coyote or large dog but tighter fencing seemed to solve the problem. January 2006 update: Despite what I thought was "air and water tight" security, the remaining white ducks disappeared over the Christmas weekend without a trace. The Lakeview Farms pond levee appears to be home for river otters who's normal diet is fish but evidently a Christmas Duck dinner was too good to pass up. The otters have the capability to tunnel under any fencing so we will need to solve the otter problem before attempting to reintroduce domestic ducks. Our farm lake remains a favorite "hanging out" spot for the wild (mallard) ducks and Canadian Geese that can fly away from danger, however.